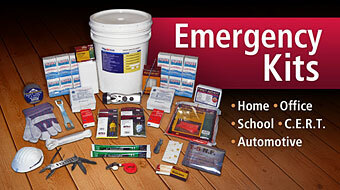 Emergency and Safety Supplies for Federal, State and Local Government Agencies! We can provide your organization's Emergency Management, Facility Management or Disaster Response Team with high quality workplace safety, emergency preparedness and disaster supplies. Our customer base is diversified, ranging from individuals to universities and school districts, police and fire departments, military branches, national parks, prominent businesses, institutional organizations, and many more federal, state and local government agencies. 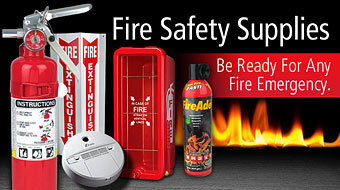 Fire Supply Depot, LLC is a small business located in Tucson, Arizona that specializes in fire extinguishers and fire safety equipment, along with a wide range of emergency preparedness and safety supplies. We ship our products from Tucson, Arizona or from one of our supplier warehouses across the US for larger orders. We are very committed to our customers and provide unparalleled customer service. You will speak to an actual person if you call with questions or concerns, not some emotionless machine. Fire Supply Depot began in 2003 selling FireAde 2000 fire extinguishing agent and small fire extinguishers to city and wildland fire departments, industry and auto racing teams. We continued to grow our product base with additional fire safety and emergency products that included heavy-duty fire escape ladders and emergency survival kits for homes and businesses. Over the years we have grown our product offerings to include an expanded line of fire, EMS and workplace safety products along with emergency preparedness kits and disaster survival products. Purchase Orders: Please call or email your info to set up an account. Customer Service Hours: Monday through Friday from 8:30 AM until 5:00 PM Mountain Standard Time.